Elmer Diktonius was a Finnish poet and composer, who wrote in both Swedish and Finnish. Elmer Diktonius was born in Helsinki. His father, August Viktor Diktonius, was a print shop foreman; he died in 1912. Adelaide Malmström, Diktonius's mother, the daughter of a contractor. The family spoke Swedish, but for practical reasons Diktonius attended Helsingin normaalilyseo, a Finnish-language school, which helped him to acquire bilingualism. Diktonius was a lazy pupil and at the age of sixteen he left the school. During this period started a period of voracious reading, which included such writers as Friedrich Nietzsche, August Strindberg, Fyodor Dostoevsky, Walt Whitman, and Knut Hamsun. After his father's death and a brief stint as a sheet-music salesman, he enrolled Helsingfors Music Institute, studying violin and composition from 1915 to 1919. During the Finish Civil war (1917-18) Diktonius's sympathies were on the Red's side, but he did not join the Red Guards. After military service in the medical corps (1919-1920) on Valamo in Lake Ladoga, he studied music in Paris, London, and Cornwall (1920-21). Diktonius's modernistic songs - first presented in a concert in 1920 - were condemned by critics, and his plan to move to Wien as a student of Arnold Schönberg was dropped. Diktonius sent Schönberg three letters. With the Swedish writer Eyvind Johnson he began a correspondence which continued for decades. In 1915 Diktonius met then 19-years-old Otto Ville Kuusinen, who became later a member of the Soviet politbyroo and whose socialist views influenced him deeply. Diktonius published in Työväen Joulualbumi his first text and was encouraged by Kuusinen to study Marxist literature. Kuusinen preached the aesthetics which aimed to awaken the masses to revolution. Financed by Hella Wuolijoki, Diktonius started his journey on October 1920 to Sweden, France, and England. 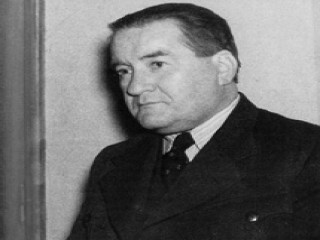 During his stay abroad Diktonius wrote several poems and met representatives of the international Communist movement. Diktonius's first book, MIN DIKT (1921), which was made up largely of aphorisms. It was published in Stockholm and edited by Kuusinen. "Democracy is the last refuge of the bourgeoisie," Diktonius declared. "Communism is going to be their end." Although the book was ignored in Finland, the young poet was introduced by the critic Hagar Olsson to Edith Södergran and other members of the modernist group. In 1921-22 Diktonius wrote for the magazine Arbetarbladet. In his sharp and sometime cruel reviews he attacked such writers as Gripenberg, Runar Schildt, and Jarl Hemmer. HÅRDA SÅNGER (1922), Diktonius's second collection of poems, was also received with little notice. However, it included 'Jaguaren' (Jaguar), perhaps the most famous poem of the author. Jaguar is a machine that hits, it has heart and it longs for beauty. The duty of the jaguar is to fly and bite and tear apart, to "kill the cry of those without feeling, the sympathy of the heartless." The text was written in Paris and it was later printed in Ivan Gollin's anthology Les cinq continents, and in a Finland-Swedish anthology edited by Edith Södergran. With BRÖDET OCH ELDEN (1922) Diktonius became a recognized member of Helsinki literary life. TASSIGA LÅGOR (1924) presented a set of "portrait poems" of the poet's cultural heroes, and showed the influence of Edgar Lee Masters. In STENKOL (1927) Diktonius's vision of revolution frightened his conservative readers. Diktonius called attention to the graves of Reds, who died during the Finnish Civil War (1917-18), a nationally traumatic period. With this work he won the appraisal young young leftist poets in Sweden. The book appeared in a period of personal crisis - his marriage to the singer Meri Marttinen, the most important woman in his life, came to pieces. A journey to Paris (1925-27) was abrupted by illness and shortage of money. His marriage ended in divorce and his wife's subsequent suicide in 1930. Because of financial reasons Diktonius lived in the country for some time. STARK MEN MÖRK (1930) marked the end of this rebellious, international period. He became interested in nature and and Finland's literary heritage, exemplified in his tribute to J.J. Wecksell, and saw threats emerging from the east. Especially Diktonius enjoyed stays at Lumparland in Ahvenanmaa islands. Diktonius participated in the establishment of the modernist journal Quosego (1928-29), and wrote music critics for Nya Argus. In 1929 he married Anna-Leena Jyrkkä, whom he had known from the late 1910s. "I'm living only for you," he said in a letter. The second marriage turned out to be more stable. In the early 1930s Diktonius moved to Kauniainen and contributed Sosialidemokraatti, Elanto, Tulenkantajat, and the Swedish magazines and newspapers Arbetet (Malmö), Nya Daglig Allehanda, Clarté and Spectrum. To protest the right-wing Lapua movement he joined Helsingfors svenska arbetarförening. In his poems and other publications Diktonius's revealed his mellower side as is seen in JORDISK ÖMHET (1938). In MEDBORGARE I REPUBLIKEN FINLAND (1935), his citizens in the Republic of Finland included democratically farmers, Fascists, orphans, and mothers. JANNE KUBIK, Diktonius's most important novel, was published in 1932. The expressionistic story depicts a longshoreman, who joins during the Finnish Civil War first the Red Guard, later the winning side of White forces, starts then during Finland's prohibition a career as a romrunner, becomes a fascist sympathizer and a bullyboy, a prematurely aged dockworker and strikebreaker, and finally falls to his death through a ship's cargo hatch. The events are quasi-scholarly commented by the author, who tries to find some sense in the life of the poor protagonist. The elliptic sentences, quick shifts of time and place made the book a pioneer work in the Scandinavian novel. Diktonius, who was completely bilingual, claimed that Janne Kubik was conceived in Finnish and published the 'original', Janne Kuutio, in 1946. In 1936 Diktonius's satirical article in Arbetarbladet on Adolf Hitler prompted a reaction from the German ambassador in Finland, and the editor of the paper, K-A. Fagerholm, was condemned to a fine. In 1940 Diktonius joined the circle around Bertolt Brecht, who stayed in Finland for a period. In the beginning of Continuation War (1941-44) Diktonius served in the army at the information department for a short period. Ideologically he had taken distance to leftist views. He eulogized in the patriotic VARSEL (1942) the composer Jean Sibelius, the novelist Frans Emil Sillanpää, and the president Kyösti Kallio. In the Swedish newspaper Dagens Nyheter Diktonius defended Finland's pact with Germany and the conquest of the Russian Carelia. After the war Diktonius made again an ideological turn and started to write critics for the Communist paper Työkansan Sanomat. His unconventional Swedish translation of Aleksis Kivi's (1834-1872) classic novel Seitsemän veljestä (Seven Brothers) appeared in 1948, and showed his skill to create a language entirely his own. Diktonius's last collections of poems, ANNORLUNDA (1948) and NOVEMBERÅR (1951) witnessed the author's emotional tiredness, with few exceptions, among them a poem about his dead mother. Most of the final decade of his life Diktonius spent in hospitals and sanatoriums. He stopped traveling because he could not afford it. In the 1950s appeared several selections and collections of his works, among them DIKTER (1955), PROSA (1955) and MENINGAR (1957). Diktonius died on September 23, 1961, in Helsinki. View the full website biography of Elmer Diktonius.